Premier Sliding Patio Doors by UniFrame are an asset to any home, adding a touch of style and class that enhances the home's visual appeal. Beautiful inside and out. Available in a wide variety of sizes and configurations - including 5-, 6- and 8-foot, two-panel widths and 9- and 12-foot three-panel widths. Beautiful glass styles to complement and enhance any decor or architectural style. Optional brass keylock adds beauty and convenience by allowing you to use your sliding patio door as a primary entrance door. We combine fusion-welding, heavy-duty weatherstripping and full one-inch thick insulated glass to create a tight, energy efficient sliding patio door. Unique three-point locking system offers more resistance to forced entry than sliding patio doors with a single lock. With one turn, heavy tempered steel rods lock the door securely at the head and sill while a tempered steel L-shaped hook secures the door at the jamb. Extra thick uiPVC has color that's solid throughout...no painting or scraping - ever. Decorator grids are within the insulated glass unit - so glass cleaning is easier. 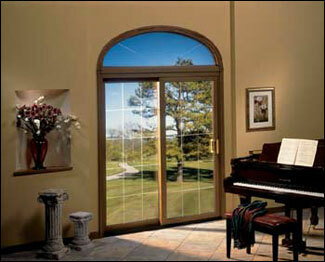 Wide styles and rails are designed with thick walls and multi-chambers to add strength and increase thermal performance. Full perimeter, high performance weather-stripping. Custom fit interlock system provides extra protection against air infiltration for enhanced energy performance. Our doors glide on tandem steel rollers and provide smooth and effortless operation, no matter how many times they are opened and closed.